Where’s the Conservative Healthcare Plan? So perhaps states could opt out of some consumer or employer mandates, which is a minor release valve. But they would still need to find other mechanisms to achieve the same liberal priorities, which in practice leaves little room to innovate—especially for a straight tax deduction or credit to purchase individual coverage or alternative insurance designs like high-deductible or value-based plans. That’s why Democrats had nothing to fear from adding such a provision originally. The Wyden-Brown bill merely moves it forward by three years, to 2014. The reality is that the liberals who wrote this bill really do think they have a monopoly on good ideas, and they do not include markets. Democrats are more than happy to give the states more freedom, as long as the states use it to impose comparable government control. arena. As Jon Cohn points out, PPACA does, in fact, allow states to offer high-deductible plans. 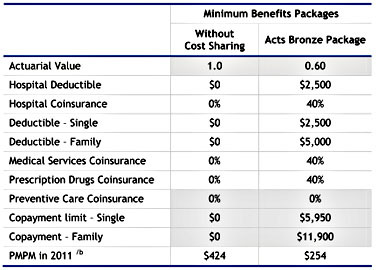 The table on the right is from the Lewin Group, and it outlines the typical coverage offered by a “Bronze” level plan under PPACA. It’s pretty stingy! The deductible for a family is $5,000, the maximum out-of-pocket expense is $11,900, and the “actuarial value” — i.e., the percentage of total medical costs covered by the plan — is only 60%. If conservatives can’t come up with a plan that competes with those targets, it means conservatives don’t have a plan. Of course, states would also be required to offer subsidies to low-income residents, and the amount of those subsidies is based on the price of “Silver” level plans. But that’s only slightly better, offering an actuarial value of 70%. These just aren’t high bars to meet. If conservatives don’t want to make health coverage widely available, they should just say so without the shilly-shallying. But if they do want to make it available — and in public, anyway, that’s what they claim — the requirements of PPACA represent the bare minimum of what you can call “coverage” and still keep a straight face. If conservatives really believe they have a better way, PPACA provides both the funding and the minimal requirements to allow them to prove it. They should get busy doing so instead of spending their time inventing feeble excuses.